There aren’t many titles that have kept my attention this year. 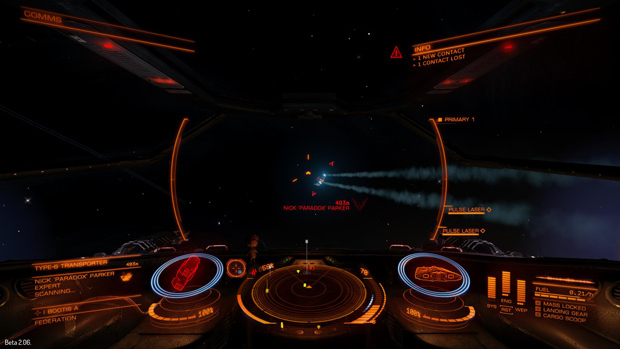 But since day 1 of playing Elite: Dangerous, I’ve been following news and updates on the game unwaveringly. Gameplay even in the early stages of beta is mind blowing, granted you can handle the disorientation of true space flight simulation. If you remember my article from earlier this year, I was very enthusiastic about the game, and despite not having a lot of content yet, the game did feel finished like a full product. That obviously was not good enough for the developers who have only sped up content pushes over the last six months. However nothing compared to the last patch, and now I have the green light to share just how awesome these recent changes are! Since I was a beta backer, and have played a small bit of the alpha I can admit that I am already a veteran of the game despite it not being out yet. Whether the mission calls for bounty hunting, goods transporting, or pirating, I’ve done it all and can live to tell about it more often than not. Yet when jumping into game following this major update, enough changes had occurred that it felt new even to me. And not just in terms of new content and places to explore, but the controls of my ships felt smooth and polished. If you aren’t familiar with Elite: Dangerous yet, let me give you a brief explanation of what the game is about and why I’m so pumped to write about it. If you have heard of the Elite game series (it’s existed for many years) then you should probably know that trading is the main focus on these games. Ever since David Braben brought out its first version of the Elite series, a lot of space fans found the trading aspect of the game the most fun. As such instead of becoming dog fighter X on the market, they branched in a direction that encouraged this more player economy focused gameplay, and found much greater success in turn. In any Elite game you begin as a basic starter pilot, learning the tricks about flying your own spaceship, and slowly but surely earn enough currency to upgrade to faster, larger, and more weapon heavy vehicles. 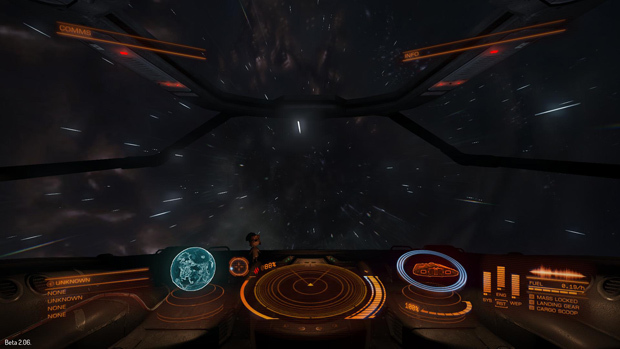 Elite: Dangerous works almost exactly the same, but thanks to recent technology has been able to implement a bit more advanced fighting elements into the equation. As such this game should appeal to a larger audience than before, as it’s really offering the best of both worlds now. 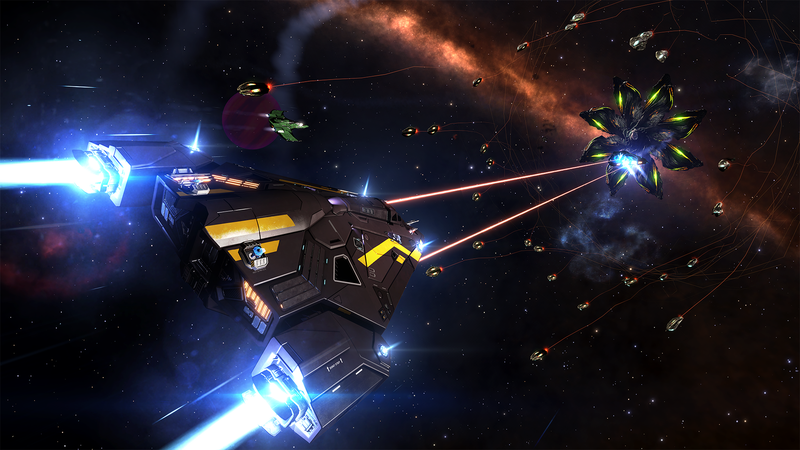 Earlier this year the game only had a handful of ships, systems and stations for the player to interact with. Most people were flying around distress signals, mindlessly blowing up ships while helping one of the many factions in this game. There wasn’t much room for advancement so it wasn’t worth anyone’s time to focus on doing so. Now however, you really get the feeling that you as a starter pilot, as numerous more advanced ships have been added with guns that will tear a newbie apart, and beta players have had the time to earn their share of intergalactic wealth to afford them. When you find yourself in your first ship, somewhere close to Azeban City, you are welcomed with your first test flight. Luckily the hell of exiting a station isn’t the first priority that you will have to make, since you are on a landing pad directly in space, things are made a little easier for you. After you have done the pre-flight check list, and made sure all the controls are familiar to you, you are ready for takeoff. At this point, you are basically let go to choose whatever you want to do with your new piloting life. 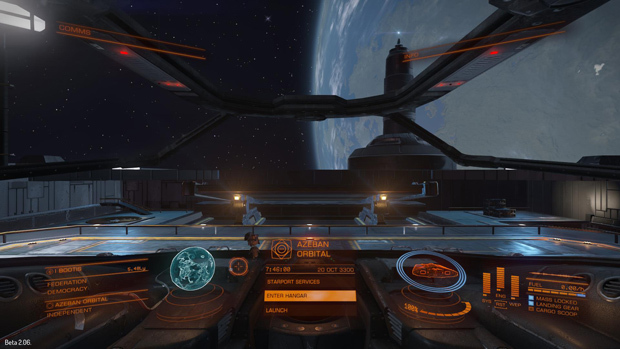 Elite: Dangerous puts the player in a position so he is free to do whatever he wants to do with his ship. You are free to choose whatever path you want to take, and with this I basically mean there are several ways of earning money and making a living. Since you start out with just a basic ship, and a couple of weapons that barely scratch the shields of all the bigger ships, you aren’t able to impact the big dogs just yet. Thus where the economics come into play as you can branch out into trading, utilizing your cargo hold for carrying goods from one location to another, or blow what little money you have on a few decent weapons to try your hand at lowbie bounty hunting. Missions are also available with rewards to help give the more themepark minded players some direction. In each station you will be able to find missions that allow you to do all sorts of things with your ship. In the earlier beta versions there were only a handful of missions available for the player to pick up, but in the latest beta stage you have a whole list of available missions, that change all the time and are different in each station and system. 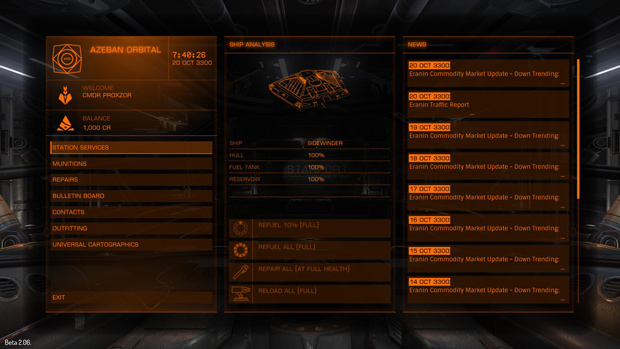 In the mission list you will be able to find a lot of different missions, like searching for wanted criminals, hunting down the normal criminals that roam in each system trying to make a living doing piracy, simple errands and other types of trading orders. Since Elite: Dangerous has a steep learning curve, I would definitely recommend every new player to figure out the basics first, and you will learn these by starting off with the simple errands like bringing different goods to nearby systems. Trading is really easy, but since there are over 500 systems that you can visit, you will need to figure out what works well in the systems around you. Trading works just like in real life; everywhere has its own levels of supply and demand, and it is up to you to find out which one of the systems is in need of a set commodity. Since you start out with a small ship and not a lot of credits, you will have to start small. You will have to find a product like coffee that doesn’t take a lot of room in your cargo, but does earn you enough profit so you can buy more fuel and eventually get enough money for a bigger ship or ship upgrades. There are also plenty of NPC pilots that basically live the same life as you, and systems are always ready to offer bounties against people messing with these NPC routes. As a bounty hunter you obviously have to shift your train of thought away from the economic considerations and more towards military strengths and weaknesses. 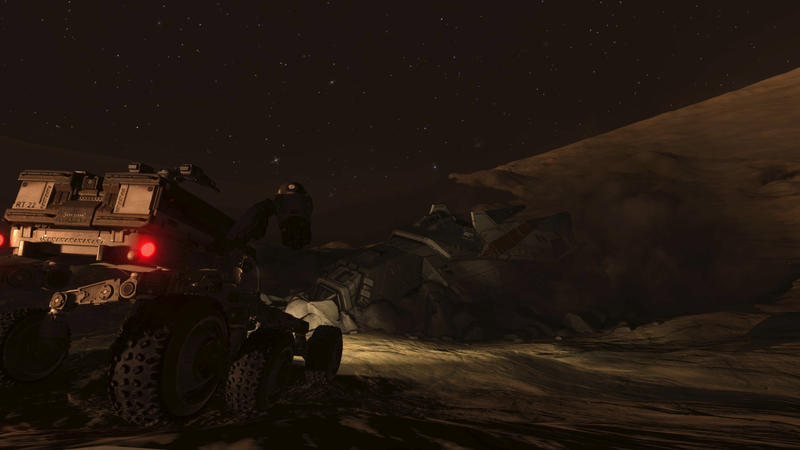 In addition to taking missions, you can also hunt for distress signals or other beacons to find wanted pilots. Just be cautious when scoping out a potential target as your small early ship is equipped with weak lasers, slow engines, and not much armor. Once engaged, chances are retreat won’t be an option for you, so pick fights you have a shot at winning. 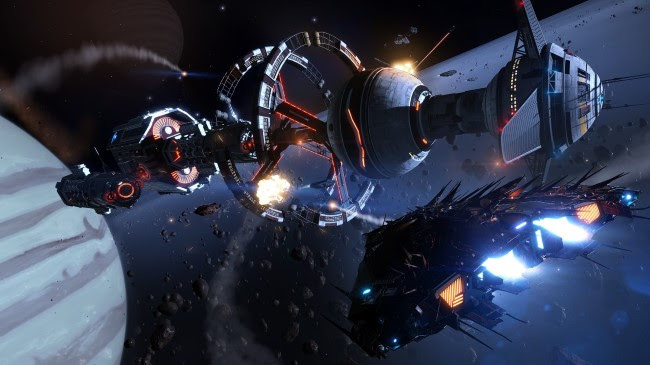 Elite: Dangerous is a game that rewards patience and grind, especially if you ever want to progress beyond your starting point. But when you do finally manage to get a new weapon, or a better ship, the satisfaction of your acquired power is only half the reward. New content will also reveal itself that you were unaware of before. You will be able to travel longer distances with better engines and increased fuel storage, with less risk of being destroyed while en route. Options to define your ship to match your style of dog fighting or bolstering your cargo hold also become available to build out your role in a larger organization. Thus far I favor bounty hunting over trading, and have spent the majority of my earned currency upgrading to better and better weapons. Eventually I will be on par and able to take on nearly any player in the unified systems that dares challenge me, but this limits my ability to make money from other mission types at the same time. Thankfully it has been confirmed that in the full release you will not be bound to only one ship by renting new garage holds. Several garages are promised at launch, which is surely the best idea for a currency sink the developers could have put together. So you might have a trading ship, to travel the longer distances between the different systems, and have a ship dedicated to hunting criminals and bringing down the pilots that dare interrupt your trade routes. Overall this will add a huge level of replayability to the game that I imagine will keep me hooked for months if not years to come. If you ask me to describe Elite Dangerous in only a thousand words, I wouldn’t be able to. The game currently has so much content for any space simulation fan to enjoy, that it’s a challenge to even compare it to any competition on the market today. 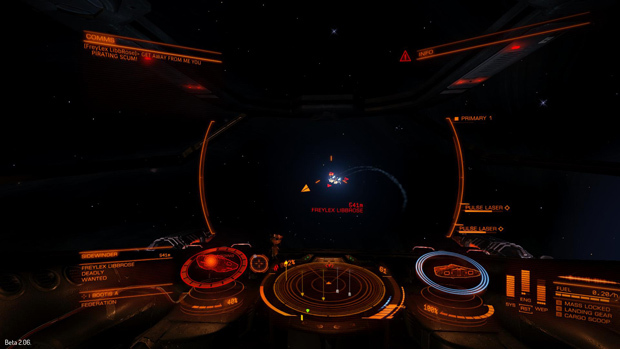 Right now, Elite: Dangerous is in the spot where it has definitely overshadowed Star Citizen. If you are a huge fan of space games, love the idea of trading, or just prefer an MMO that emphasis exploration and freedom in a sandbox environment, then you should do whatever needed to get into beta and join this ever growing community. Right now the game is in such a finished state that I can only dream of what they have in store for the full release later this year. It’s safe to say that David Braben has done it again. The Elite game series isn’t going down in flames anytime soon.